Force platforms measure ground reaction forces during locomotive movements such as walking and running. A 50-m force platform system is installed into the SP Lab. The length of this system is the longest for any track in the world using force platforms (The track itself is 90 m long.). 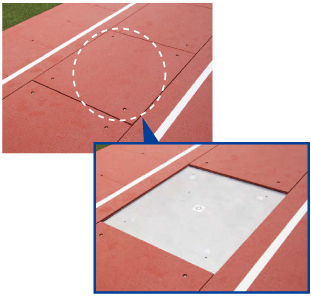 At the starting line, force platforms are built into the area where the athlete’s feet and hands touch the track, making it possible to measure the athletic skills required for sprinting at the start of a race. 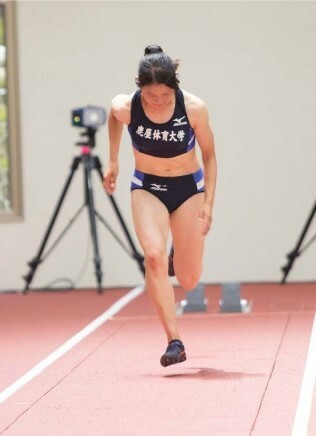 In the past, when using force platforms to measure ground reaction force during sprinting, data had been gathered using force platforms approximately 1 to 7 m in length, and the different sets of sprinting data had been combined while changing the start line. The need for athletes to focus on stepping on the force platforms sometimes prevented them from running in their real form. In the SP Lab, stepping strength can be measured for a distance of up to 50 m for a single sprint. This allows the runners to run under similar conditions to an actual race. 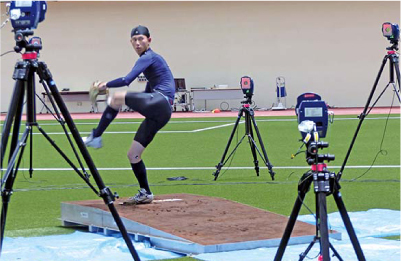 Data gathered from the force platforms can be monitored in real time, and ground reaction forces during running (i.e., vertical direction, direction of movement, and horizontal direction), together with momentum and the points where the feet touch the ground on each stride can be determined. 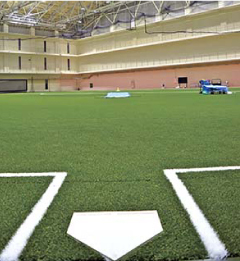 Inside the facility, natural dirt is used to gather data for both pitching and batting. In the past, stepping strength had been measured on rubber mats or boards with hard surfaces while the athletes practiced against net wearing sneakers. This facility allows players to obtain data concerning their individual skills under what is close to actual game conditions.